Blackjack rules will definitely be not enough for you to know if you want to win blackjack game for sure; certainly, they are your basic knowledge, but real professionals also use such a thing as blackjack basic strategy: it had been developed for all types of blackjack hands you can have during the game, and this strategy determines your every step to do in order to reach your goal - beating blackjack. Special strategy charts were created by experienced players and real game experts: everything a gambler should do is to learn them by heart because it is prohibited to take such charts to casinos with you and use them there. There are 3 types of hands a player can get at blackjack - soft hands, hard hands and splitting pairs - and blackjack basic strategy provides tips for each of them. A hard hand of blackjack is a hand which does not contain an Ace or where an Ace can not be counted as 11 without busting. If you have 12-16 points and a dealer's card is 2-6, you should STAND. If you have 12-16 points and a dealer's card is 7-Ace, you should HIT. If you have 17-21 you should STAND: the big chances are that you'll bust if you take the third card. A soft hand of blackjack is a hand which contains an Ace and where this Ace can be counted as 11 without busting. You have 13-14: HIT if a dealer has 2-4, 7-Ace; if a dealer has 5 or 6 - DOUBLE. 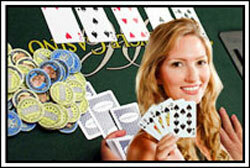 You have 15-16: HIT if a dealer has 2,3, 7-Ace; if a dealer has 4-6 - DOUBLE. You have 17: HIT if a dealer has 2, 7-Ace; if a dealer has 3-6 - DOUBLE. You have 18: STAND if a dealer has 2, 7,8; HIT if a dealer has 9-Ace; DOUBLE if a dealer has 3-6. You have 2's, 3's and 7's, and a dealer's card is 2-7. You have 4's, and a dealer's card is 5-6. You have 6's, and a dealer's card is 2-6. You have 9's, and a dealer's card is 2-6, 8 or 9.